ImpersonateX allows you to easily impersonate any user account on your DNN site. It includes a custom form action, and a custom template tag. Installation also includes a starter form, and a starter template to get you started quickly! 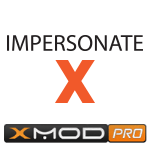 As with everything that's XMod Pro, you can completely customize the template and/or form action to meet your needs. You can use the starter form and/or template right out of the box, or construct advanced solutions based on your business rules. It is hereby understood and agreed that Reflect Media Group LLC ("Licensor") is the owner of all right title and interest to ImpersonateX Custom Form Action ("Software") which you are about to purchase a license to use and download. You, as licensee ("Licensee") through your purchase of this license to use the software do not acquire any ownership rights to the Software. The Software which accompanies this license is the property of Licensor and is protected by copyright law. Licensor reserves the right to transfer it rights herein and ownership interest in the Software. In the event Licensor transfers its rights herein and ownership interest in the Software, such transfer shall not affect the rights and obligations of any party to this agreement and this agreement shall remain in full force affect.